In the difficult conditions for bulk owners Bureau Veritas’ classed fleet of bulkers grew by 7% in 2015 to 1,052 vessels totalling 73.5m dwt. That total was boosted by 60 bulkers in service being moved to BV class and 54 ships totalling 3.3m dwt being delivered from shipyards. Owners sought more efficient ships and reduced operating costs in a fight against fleet overcapacity and no sign of freight rates lifting. The 54 new bulkers built and delivered to owners with BV class included the first 20 Ultramax vessels. Eco-designs were in favour including three new generation Dolphin 64 SDARI 64,000dwt bulkers built at Jaingsu Yangzijiang for Greece’s Starbulk, the first of a series of eight sister ships. Safety Management Overseas benefited from Panamax efficiency gains when it took two newly-designed Panamax vessels built to BV class at Sasebo Heavy Industries, Japan. The vessels offer 3,000dwt extra capacity and reduced fuel consumption of 10%. 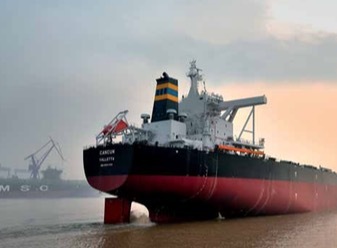 France’s Louis Dreyfus Armateurs took four efficient Handysize vessels built to BV class at China’s Tianjin Xingang yard, part of a series of ten sister ships. Japan Marine United delivered to BV-class 60,000dwt bulkers to Italy’s Augustea Technoservices. The Future 60 vessels deliver increased capacity. Taiwan’s U-Ming took delivery of the only two Capesize vessels in the year, 183,000dwt vessels built at China’s Shanghai Waigaoqiao yard. China’s Sinopacific built three 63,500 ultramax vessels to BV class, two for Allseas Marine and one for Norbulk while Chengxi built three similar size vessels for Wah Kwong. In the smaller sizes Nisshin Shipping took four 39,000 Handysizes from Jiangmen Nanyang while Laskaridis Shipping chose BV class for two slightly bigger 39,300 dwt units that were built at Penglai Zhongbai Jinglu. Despite the difficult market owners in USA, China, Japan and Taiwan were able to order new tonnage against long-term contracts. The largest order was for six 84,000dwt Kamsarmax vessels for Foremost Maritime, to be built to BV class at Japan’s Oshima yard. In total only 16 new bulkers were ordered, down dramatically on the previous years. The orders included an 81,600dwt bulker for Taiwan Navigation and a sister vessel for Singapore’s Gina Shipping ordered at Oshima and two 63,500dwt vessels ordered by OAL Shipping, Ukraine, to be built at Yangzhou Dayang, China. The first orders for bulkers to be built to the new Harmonised Common Structural Rules were placed during 2015. Bureau Veritas invested heavily in working with shipyards and designers to ensure that its tools and rules were fully up to date and that yards were able to work quickly and efficiently with VeriSTAR and its powerful suite of software.